Update reproduction French Provincial furniture fearlessly if you want pieces that look current and not thrift-store style. You don't need to preserve the faux finish of a fake antique, and the underlying wood is likely unattractive, so re-imagine that dresser as a hall commode or the dining chairs as gallery pieces. Use enamel gloss paint, a little gilding wax and lots of clear lacquer to transform dull and dated chairs into splashy statements. 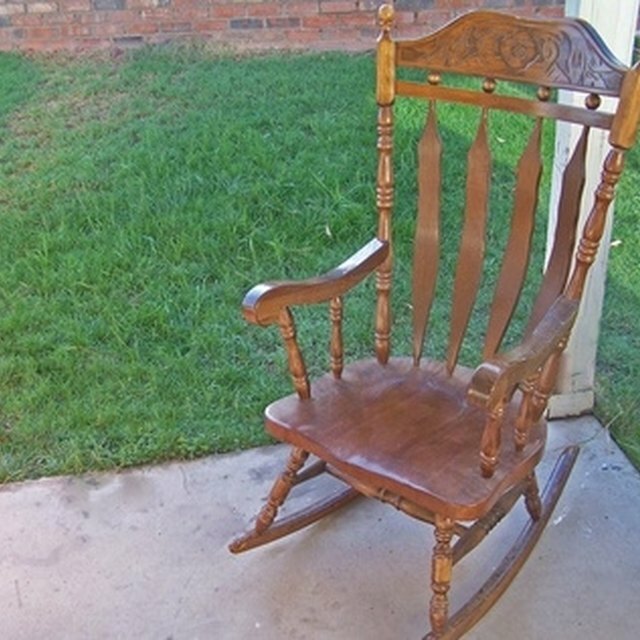 Wipe down the chair to be refinished and remove the upholstered seat. The seat may just pop up when pushed from below or you may have to unscrew it from beneath. Set the seat aside. Lay down the protective dropcloth over the work surface. Go over the chair with steel wool or medium-fine sandpaper to roughen up the finish so the new paint will adhere. Wipe down the sanding dust, vacuum and then use a damp rag to get the last dust off the piece. Apply high-gloss paint in a bright contemporary color to the chair, using a narrow paintbrush. Allow the first coat to dry and follow manufacturer's instructions about prepping for a second coat. Some paints do not require light sanding with extra-fine sandpaper between coats, some do. If you sand again, wipe down the dust again before applying the final coat. Remove the seat upholstery while the chair is drying, lay it over the replacement fabric you have chosen and use the old fabric as the pattern to cut the new. Replace the padding on the seat with new foam or batting--it can be glued or stapled in place with a staple gun. Stretch the new fabric over the padding and the seat and staple it to the underside of the wood seat. Apply wax gilding to the scrolls and moldings on the chair with a small brush. Work in small sections so you can control how much color stays on the piece. After two or three minutes, use a lint-free cloth to wipe off as much of the gilding as you like--be consistent with the amount you leave on each gilded section of the chair. Use gold wax for a warmer tone, silver for a kickier, modern look. Let the wax set for an hour. Buff the wax lightly. Spray or paint the chair with clear polyurethane finish to protect it and add more gloss. Once the topcoat dries to a hard finish, reinsert the seat into the chair frame, securing it with the original screws if necessary. Wear a paper dust mask when sanding so you don't breathe in the paint particles.